Dysport Specials, Sculptra Specials, Restylane Specials May 2014 | Daiquiri R.N. Join us for refreshments, treatments, specials, and LOTS OF FUN! Our office is conveniently located in North San Diego County in the beautiful city of Encinitas. 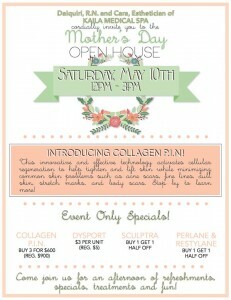 We invite you to come join us as we celebrate Mother’s with beauty specials that will refresh and vitalize.